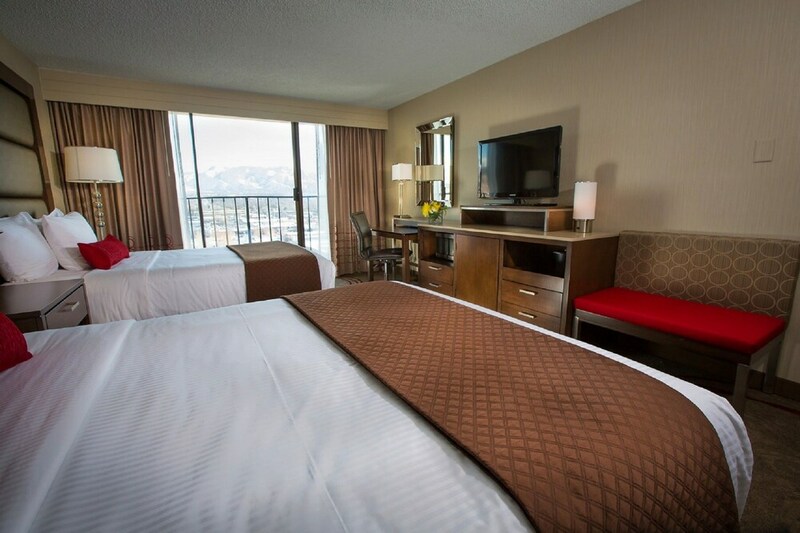 Your stay at this Downtown Salt Lake City hotel places you within 2 miles (3 km) of Salt Palace and Temple Square. Capitol Theater and City Creek Center are also within 2 miles (3 km). This smoke-free hotel includes 2 restaurants, an outdoor pool, and a spa tub. Traveling on business? 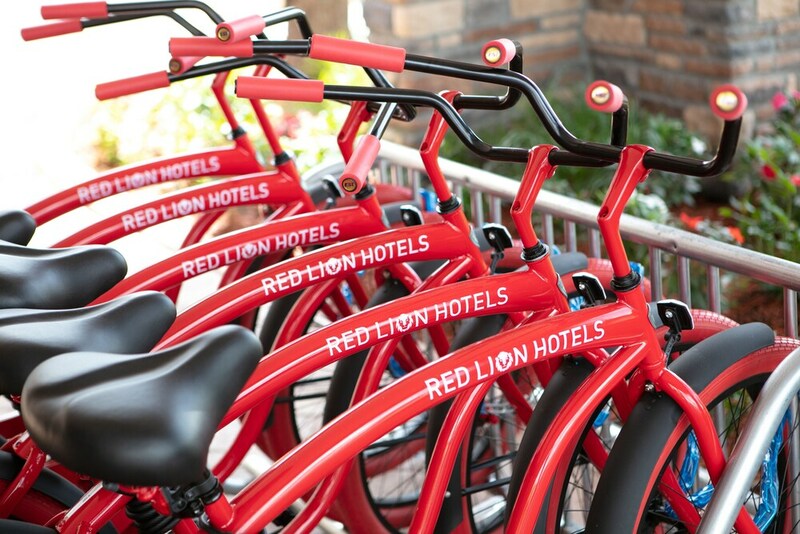 Take advantage of the business center, free WiFi in public areas, and free airport shuttle. You'll appreciate the fitness center, bar/lounge, and free newspapers. 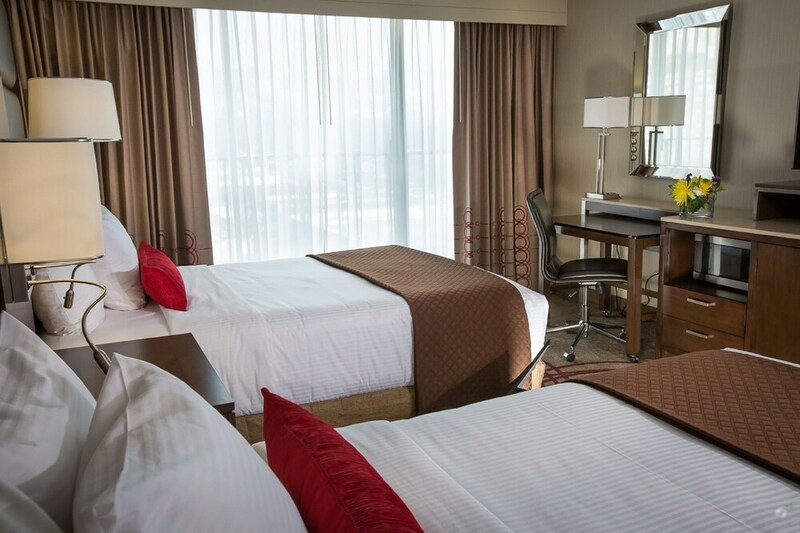 Featuring conveniences like refrigerators and microwaves, the 394 guestrooms also offer free WiFi and flat-screen TVs with cable channels. Pillowtop beds, coffee/tea makers, and free local calls are also available. I made a cross country drive and decided to spend a little more for a hotel this night due to the following day being exceptionally longer on the road. Check-in was great, the staff members were very friendly. Parking here is strange, with several little parking lots. Lots felt very sketchy and I spent the evening peeking out the window now and then and feeling uneasy with my car being there. The hotel itself was old looking and a bit run down. I needed a pet room but I had stayed at several hotels at this point and their pet rooms were wonderful. The room itself wasn't terrible, nice laminate wood floors with a lovely rug, comfortable beds and pillows, nice mural on the one wall. However, the glass doors to the balcony had duct tape on them, walls had marks on them, and the lamp shade looked like someone spilled red kool-aid all over it. My friends pillow had hair on it but she just ended up using another. My biggest complaint was the bathroom -- I was embarrassed for the hotel. The water in the shower drained so painfully slow that after a short shower the water was past your ankles. The toilet seat was peeling away and looked disgusting. The ceiling was peeling and looked like they were dealing with mold. The door to the bathroom wouldn't stay shut. They made a solid attempt at trying to clean the bathroom but it was absolutely horrid. Salt Lake City was beautiful but this hotel was definitely not anything worth the amount that we paid for it. I would not recommend. Hello, We are sorry to hear you had issues during your stay. I will pass notes to our housekeeping and engineering manager's to fix these issues. We could have moved you rooms at any time if you had wished. Thank you for providing us with your feedback. Hotel was clean, quiet and staff friendly. Would stay there again on next visit to SLC. Thanks for staying with us. We appreciate your feedback and we hope to see you back soon! Other than the dirty window the experience was fantastic, they got us in and out with ease and everything went smooth. Thank you for your feedback! We are excited that you enjoyed your visit! We look forward to your return. Walking into lobby could not find front desk, happened to hear & see a man talking to someone who was working a computer at a temporary set up. This person was the front desk. Never greeted us or looked up. Had to ask for map of area & places to eat. Rug in our room was dirty with hair & crumbs. Had to ask maid twice to vacuum rug. Was not her room but agreed to do it. Bathroom walls were rough looking. Towels & linens were clean. Bed was comfortable. Nice hotel, not too far from downtown. Accommodating staff. When you went to the ice machine you passed where they have staged the trash for removal. this being at 8 pm. The shuttles for the hotel take up all the parking in front of the hotel as well as the drop off points making the guests park in the back of the hotel to get registered. After a day on the snow, enjoy a relaxing soak in the spa tub and an invigorating swim in the outdoor swimming pool. When the sun goes down, sip après-ski drinks in the hotel's bar. There are 2 restaurants on site, along with a coffee shop/café. WiFi is free in public spaces. Parking is available for a fee. This 3-star Salt Lake City hotel is smoke free. Hotel RL Salt Lake City offers 394 air-conditioned accommodations with complimentary bottled water and coffee/tea makers. Beds feature pillowtop mattresses. Flat-screen televisions come with premium cable channels. Guests can make use of the in-room refrigerators and microwaves. Bathrooms include shower/tub combinations, designer toiletries, complimentary toiletries, and hair dryers. This Salt Lake City hotel provides complimentary wireless Internet access. Business-friendly amenities include desks and phones; free local calls are provided (restrictions may apply). Additionally, rooms include irons/ironing boards and blackout drapes/curtains. Housekeeping is offered daily and hypo-allergenic bedding can be requested. For a fee, guests can enjoy full breakfast daily from 6:00 AM to 10:00 AM. The Restaurant - This restaurant specializes in American cuisine and serves breakfast, lunch, and dinner. A children's menu is available. Open daily. The Lounge - This lobby lounge specializes in American cuisine and serves dinner and light fare. Open daily. In the evening you can catch a show at the Living Stage, a recently launched on-site venue featuring local artists and performers. Sit back and swap stories with other guests while you enjoy the laid-back atmosphere. 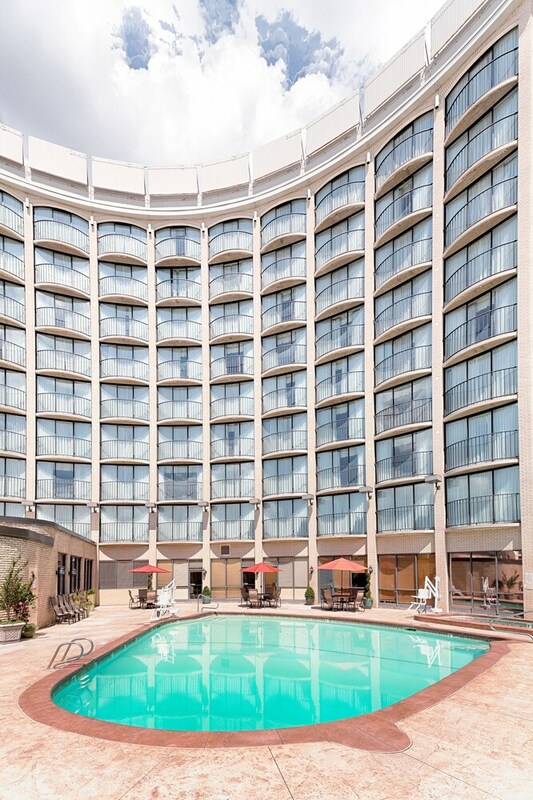 This Salt Lake City hotel's splash pool is open seasonally, and the spa tub is available year-round. Seven world-class ski resorts are within an hour's drive of the hotel. The nine-hole Nibley Park Golf Course is less than five miles away, and 18-hole Wingpointe Golf Course is seven miles away, 18 holes; both are public.